This course is for dogs 18 weeks to any age (it’s never too late!) who have had no formal training. The first session is 1.5 hours long. Sessions 2 through 6 are 1 hour long. Lessons are taught using positive reinforcement methods and include basic vocabulary to improve communication between dog and owner. The course will also cover correction of common behavior problems, such as barking, jumping, and possessiveness. 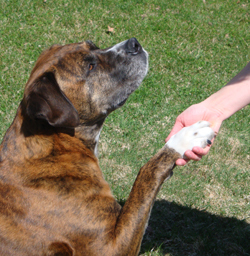 Emphasis is placed on safety, manners and an improved relationship between you and your pet. This course is the first step toward enjoying a well-behaved friend at home and in public.